The parking lot overflowed with cars — 150 to be exact. Driving around in circles, finally we spotted an empty spot. Everywhere I looked, people were putting on skis, or putting on snowshoes. It was going to be a busy day at Brainard Lake. An hour later, I wouldn’t have guessed that anyone was there. 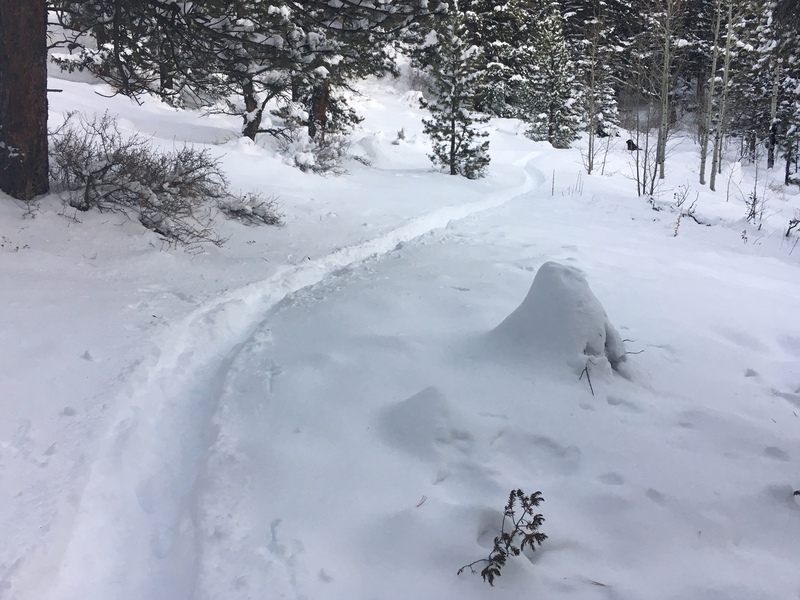 As we skied along the Little Raven Trail, hushed silence enveloped us. The trees laden with snow created the perfect winter scene. More than 30 minutes went by as we slid over the little drifts of snow. Animal track dotted the sides of the trail, perhaps left by a snowshoe hare. Still we saw no one. Where were all those people whose cars we had seen in the parking lot? When we arrived at the junction of the CMC and Little Raven Trail, we heard voices. Through the trees we could see Brainard Lake and the road. Groups of people chatted, while their dogs meandered about. All those people had followed the road most traveled. It seems strange that when given the choice to take a scenic trail through the woods, or tromp along a road packed down with snow, most take the road. Perhaps the road seems safer and more familiar. I really don’t know why. But what I do know is this phenomenon is not unique. Go to any national park, or ski area, and you will witness it first hand. Many people steer clear of the most popular national parks, not wanting to deal with the crowds. It’s true if you visit Rocky Mountain National Park and go to Bear Lake, you will not be alone. In fact, a hike to Alberta Falls will find you shoulder to shoulder with people of all ages. But if you choose to walk the trail to Timber Lake, or visit the northern part of the park off Highway 14, you may walk for miles without seeing a single soul. I remember visiting Yosemite National Park over Fourth of July weekend, and walking the trail to Ostrander Lake. I passed four or five people in the first mile or so, and then — nothing. However, if I’d gone to Yosemite Valley and walked to Bridal Veil Falls, I’d have spent quality time with at least 100 other visitors craning their necks to gaze upon the waterfall. This is particularly true if you’re willing to go more than two miles out from any trailhead, even the popular ones. Most people only want to spend an hour or two, so will choose destinations that fit in the 2-mile spectrum. It’s true even for ski resorts. At my home resort, Winter Park, I know to avoid skiing Cranmer, a very popular intermediate trail, that seems to attract hordes of skiers. But if I wander over to Vasquez Ridge, and ski down Stagecoach, I just might have the whole trail to myself. What is it about us that we seek the trail most traveled? I believe the internet is partly to blame. We research our trips ahead of time, and found out the recommended trails. Then, like sheep following other sheep, we add to the critical mass by doing the same. What if we took another trail? One we knew nothing about it? We wouldn’t be guaranteed the scenic experience we read about in such glowing terms. But we might find something else we would treasure just as much. The solitude of a wilderness experience — the sights and sounds of nature to have all to ourselves.